Musical lyrics may represent an artist's perspective, but popular songs reveal what society wants to hear. Lyric analysis is no easy task. Because it is often structured so differently than prose, it requires caution with assumptions and a uniquely discriminant choice of analytic techniques. Musical lyrics permeate our lives and influence our thoughts with subtle ubiquity. The concept of Predictive Lyrics is beginning to buzz and is more prevalent as a subject of research papers and graduate theses. This case study will just touch on a few pieces of this emerging subject. To celebrate the inspiring and diverse body of work left behind by Prince, you will explore the sometimes obvious, but often hidden, messages in his lyrics. However, you don't have to like Prince's music to appreciate the influence he had on the development of many genres globally. Rolling Stone magazine listed Prince as the 18th best songwriter of all time, just behind the likes of Bob Dylan, John Lennon, Paul Simon, Joni Mitchell and Stevie Wonder. Lyric analysis is slowly finding its way into data science communities as the possibility of predicting "Hit Songs" approaches reality. In this tutorial, Part One of the series, you'll utilize text mining techniques on a set of lyrics using the tidy text framework. 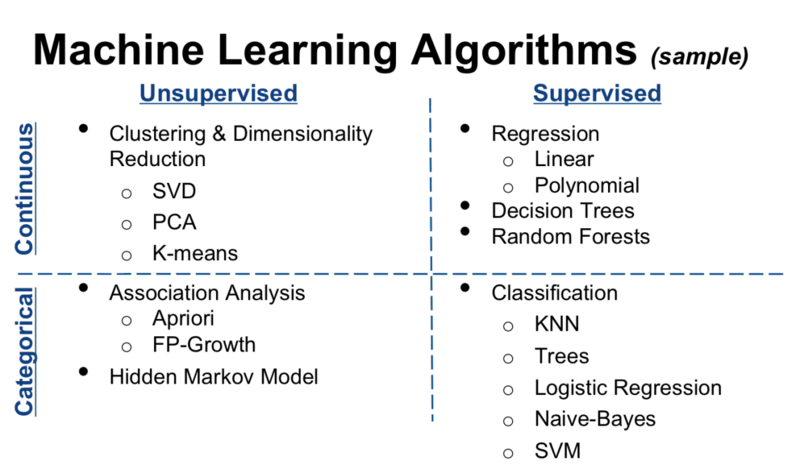 Tidy datasets have a specific structure in which each variable is a column, each observation is a row, and each type of observational unit is a table. After cleaning and conditioning the dataset, you will create descriptive statistics and exploratory visualizations while looking at different aspects of Prince's lyrics. Part One of this tutorial series requires a basic understanding of tidy data - specifically packages such as dplyr for data transformation, ggplot2 for visualizations, and the %>% pipe operator originally from the magrittr package. Each tutorial will describe the tools you can use for your analysis, but may not get into detail for every step. You will notice that several steps are typically combined using the %>% operator. As this is also a case study, it's important to remember that all inferences that you make are purely observational; hence, correlation does not imply causation. Tip: for background on the tools used, two good resources are R for Data Science by Garrett Grolemund and Hadley Wickham; and Text Mining with R by Julia Silge and David Robinson. In a separate tutorial, Part Two, you will cover Sentiment Analysis and Topic Modeling to capture the overall mood and themes in Prince's music and their application to societal perspectives. 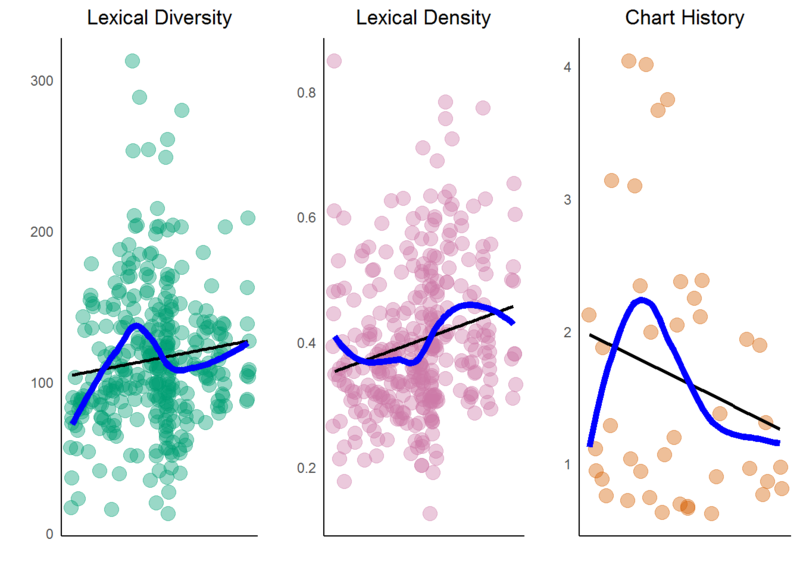 You will work with a sentiment lexicon, assess binary and categorical sentiments, plot trends over time, and look at n-grams and word associations. 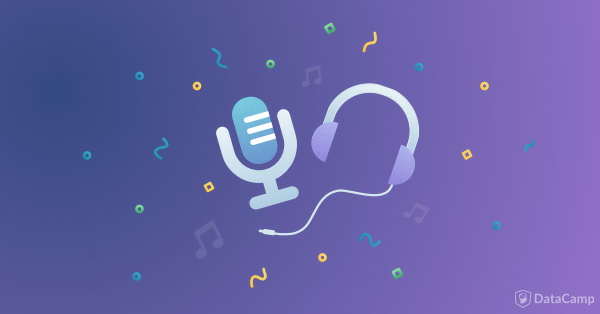 You'll also use Natural Language Processing (NLP) and clustering techniques such as Latent Dirichlet Allocation (LDA) and K-Means to tease out motifs in the lyrics. 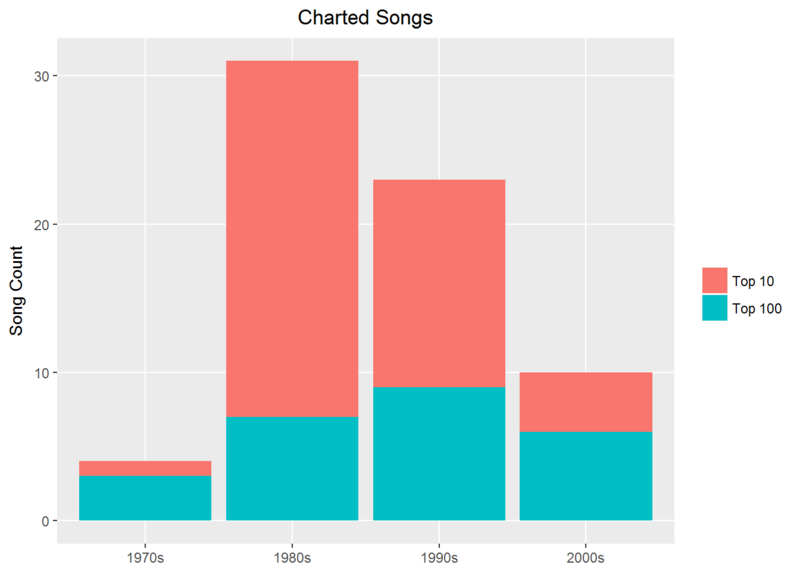 In yet another tutorial, Part Three, you will bring the work full circle by using your exploratory results to help predict what decade a song was released, and more interestingly, whether a song will hit the Billboard charts based on its lyrics. 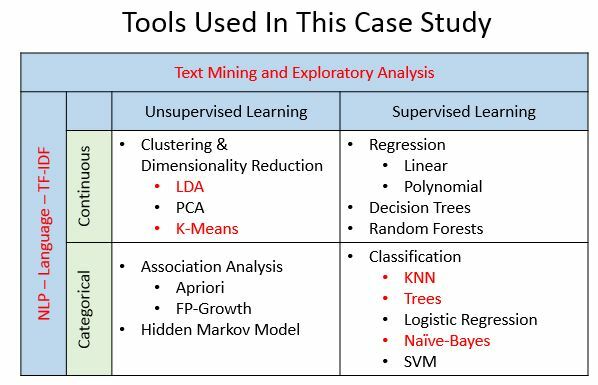 You'll use machine learning tools such as Decision Trees (rpart and C50), K-Nearest-Neighbors (class), and Naive Bayes (e1071) to produce a classifier that can accept text. All three parts will utilize the same dataset of Prince lyrics, release year, and Billboard chart positions. The techniques in this study can be applied to many other types of text as well. In fact, results for standard prose are more easily interpreted because lyrics, in general, are often designed with an indirect message and subtle nuances. In summary, there are many different methods for analyzing lyrics. These tutorials cover those highlighted in red in the graphic below. Note that this graphic is simply a high level representation of a very "fuzzy" picture. And no, I don't mean the image itself! The truth is that the different aspects of modeling and machine learning techniques are blurry now and don't necessarily fit into a single box as shown below. So put on some 3D glasses while looking at the image and it may make more sense! In addition to learning and practicing new skills, this tutorial aims to address basic questions about the concept of lyric analysis. Recent studies show that "lyrical intelligence" could be declining in popular music. Some studies even suggest that words used in No.1 Hit Songs align with reading levels of US 3rd grade schoolchildren. Is it possible to utilize text mining, NLP, machine learning and other data science methods to shed insight on such a topic? Is it possible to identify themes that appeal to society based on how well a song is received? Is it possible to predict whether a song will do well based on lyrical analysis alone? In this first tutorial, you will examine the lyrical complexity of Prince's music as an exploratory exercise. Before diving in, think about what you're trying to discover. What questions are of interest? You will first walk through an analysis of the dataset. What does it look like? How many songs are there? How are the lyrics structured? How much cleaning and wrangling needs to be done? What are the facts? What are the word frequencies and why is that important? From a technical perspective, you want to understand and prepare the data for sentiment analysis, NLP, and machine learning models. A popular method for obtaining data for text mining is using the rvest package to scrape the content from the web. I was able to scrape Billboard Chart information and Prince lyrics from various sites and join them up on song title. There was a bit of wrangling involved because of inconsistent naming conventions for the titles. I then made a subjective decision to remove all songs that were not the original versions, that is, remixes, extended versions, club mixes, remakes, etc. I also removed albums that contained historical collections of his Hit Songs in order to avoid repetition. I did some minor cleaning and saved the result to a csv file that could be used for this tutorial. Since Part One focuses on text mining, I have not included that code for this tutorial, but the dataset is available for you to download here if you'd like to follow along. ##   "X"            "text"         "artist"       "song"
##   "year"         "album"        "Release.Date" "US.Pop"
##   "US.R.B"       "CA"           "UK"           "IR"
##  "NL"           "DE"           "AT"           "FR"
##  "JP"           "AU"           "NZ"           "peak"
Because I created this file, I know that X is just a row number and text is the actual lyrics. The other needed fields include song, year, and peak (which shows its placement on the Billboard charts). US.Pop and US.R.B are peak chart positions for the US (Pop and R&B charts), so keep those around as well, and drop all the other fields for now. Do this by taking the original dataset, prince_orig, and piping that into select() using %>%. This way you can read code from left to right. Also, notice that select() allows you to rename the columns all in one step. So go ahead and set text to lyrics and rename the US columns to the tidyverse style using "_" instead of ".". Then store the results in prince, which you will use throughout the tutorials. dplyr provides a function called glimpse() that makes it easy to look at your data in a transposed view. The first obvious question is how many observations and columns are there? Using the dim() function, you see that there are 7 columns and 824 observations. Each observation is a song. Like I said... prolific! Looking at the lyrics column for one of the songs, you can see how they are structured. There are plenty of opportunities to clean things up, so let's get started. There are different methods you can use to condition the data. One option would be to convert the data frame to a Corpus and Document Term Matrix using the tm text mining package and then use the tm_map() function to do the cleaning, but this tutorial will stick to the basics for now and use gsub() and apply() functions to do the dirty work. First, get rid of those pesky contractions by creating a little function that handles most scenarios using gsub(), and then apply that function across all lyrics. # "won't" is a special case as it does not expand to "wo not"
You'll also notice special characters that muddy the text. You can remove those with the gsub() function and a simple regular expression. Notice it's critical to expand contractions before doing this step! To be consistent, go ahead and convert everything to lowercase with the handy tolower() function. Examining the lyrics now shows a nice, cleaner version of the original, raw text. Another common step in conditioning data for text mining is called stemming, or breaking down words to their root meaning. That's a topic in itself which can be covered at a later time. For now, take a look at the summary of the prince data frame. 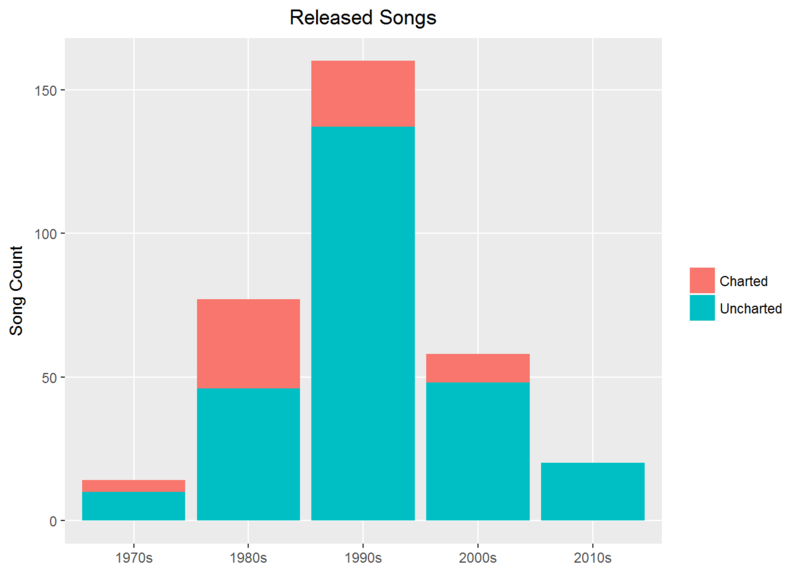 As you can see, there are 37 years of songs, and the lowest charted song (that exists in the dataset) is at position 88. You can also see that there are quite a few NAs for year and peak. Since you'll be doing different types of analyses, keep the full dataset around in the prince data frame and just filter when needed. 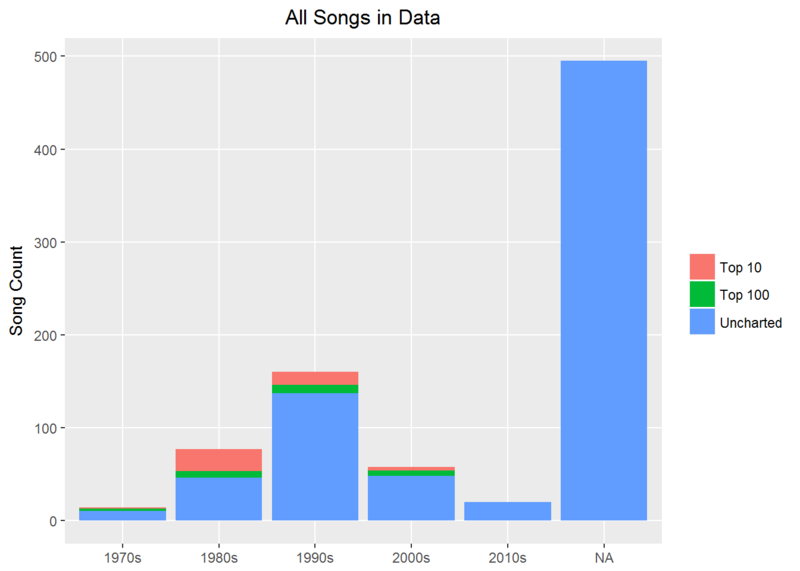 Since one of your target questions is to look for song trends across time, and the dataset contains individual release years, you can create buckets and group the years into decades. Use dplyr's mutate() verb to create the new decade field. One way to create the buckets is by utilizing ifelse() along with the %in% operator to filter by year and bin the songs into decades. Then store the results back into prince (essentially adding a new field). You can do the same thing for chart_level, which represents whether a song peaked in the Top 10, Top 100, or did not chart (that is, uncharted). These are mutually exclusive, so Top 100 does not include Top 10 songs. In addition, create a binary field called charted indicating whether a song reached the Billboard charts or not (that is, a popular song). Use write.csv() to save for use in later tutorials. In order to customize graphs, I like to create a unique list of colors to keep the visuals consistent. There are plenty of places on the web to get distinct colors via their hexadecimal code representation as below. If you have a preference for your graphs, you can also create your own theme you can apply to ggplot() when needed. 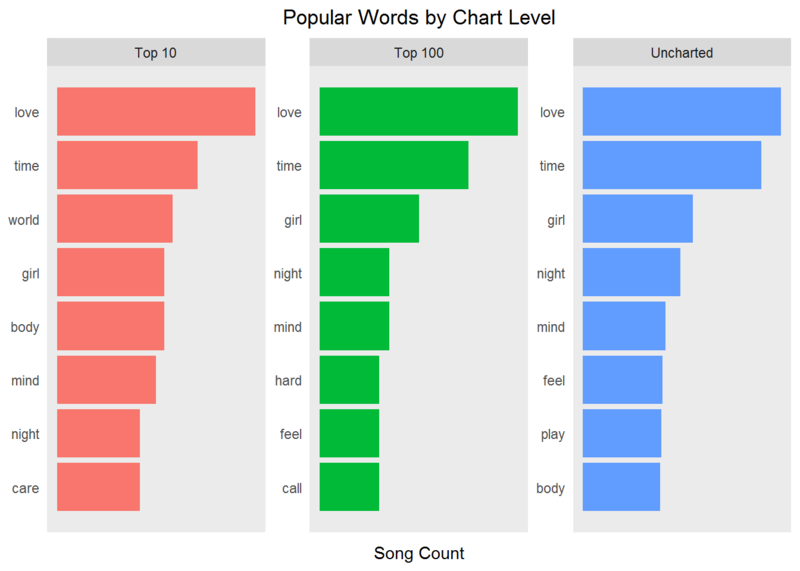 Before getting into text mining, start with a basic view of what your data holds at the song level. Now would be a good time to get a visual of how many songs Prince released per decade. As a reminder, his professional career started in 1978 and went all the way through 2015 (as shown in the summary() statistics above). But since we're looking at trends now, and the dataset has a large number of blank values for year, you'll want to filter out all the release year NAs for the first graph. Using dplyr's filter(),group_by() and summarise() functions, you can group by decade and then count the number of songs. The function n() is one of several aggregate functions that is useful to employ with summarise() on grouped data. Then using ggplot() and geom_bar(), create a bar chart and fill the bars with the charted category. This clearly shows his most active decade was the 1990s. Now create a similar graph with chart_level. Remember to group_by() both decade and chart_level so you can see the trend. In this graph, you'll only look at charted songs so filter out everything else using peak > 0. Pipe the group_by object into summarise() using n() to count the number of songs. As you store this in a variable, you can pipe that to ggplot() for a simple bar chart. Notice that out of all Prince's charted songs, the majority reached Top 10. But what is even more interesting is that his most prolific decade for new songs was the 1990s, yet more chart hits occurred in the 1980s. Why is this the case? Keep this question in mind as you walk through the sections on text mining. As you can see, Prince wrote hundreds of songs for which there is no release date in the data. For sentiment analysis or exploratory analysis you can use all the data, but for trends over time you have a much smaller set to work with. This is OK - just something to keep in mind. Text mining can also be thought of as text analytics. The goal is to discover relevant information that is possibly unknown or buried beneath the obvious. Natural Language Processing (NLP) is one methodology used in mining text. It tries to decipher the ambiguities in written language by tokenization, clustering, extracting entity and word relationships, and using algorithms to identify themes and quantify subjective information. You'll begin by breaking down the concept of lexical complexity. To begin the analysis, you need to break out the lyrics into individual words and begin mining for insights. This process is called tokenization. Tidy Text: a table with one token per row. In this case study, a token will be a word (or an n-gram which will be discussed in Part Two). Tokenization is therefore the process of splitting the lyrics into tokens. This tutorial will use tidytext's unnest_tokens() to do this. See tidytext documentation for more detail. But before you tokenize anything, there is one more step in cleaning the data. Many lyrics, when transcribed, include phrases like "Repeat Chorus", or labels such as "Bridge" and "Verse". There are also a lot of other undesirable words that can muddy the results. Having done some prior analysis, I picked a few that I'd like to get out of the way. To unnest the tokens, use the tidytext library, which has already been loaded. Now you can take advantage of dplyr's capabilities and join several steps together. From the tidy text framework, you need to both break the text into individual tokens (tokenization) and transform it to a tidy data structure. To do this, use tidytext's unnest_tokens() function. unnest_tokens() requires at least two arguments: the output column name that will be created as the text is unnested into it ("word", in this case), and the input column that holds the current text (i.e. lyrics). You can take the prince dataset and pipe it into unnest_tokens() and then remove stop words. What are stop words? You know them all too well. They are overly common words that may not add any meaning to our results. There are different lists to choose from, but here you'll use the lexicon called stop_words from the tidytext package. Use sample() to show a random list of these stop words and head() to limit to 15 words. "where"      "sensible"   "except"     "wouldn't"   "normally"   "relatively"
 "has"        "said"       "yet"        "how"        "this"       "available"
So, after you tokenize the lyrics into words, you can then use dplyr's anti_join() to remove stop words. Next, get rid of the undesirable words that were defined earlier using dplyr's filter() verb with the %in% operator. Then use distinct() to get rid of any duplicate records as well. Lastly, you can remove all words with fewer than four characters. This is another subjective decision, but in lyrics, these are often interjections such as "yea and hey". Then store the results into prince_words_filtered. Note: for future reference, prince_words_filtered is the tidy text version of the prince data frame without 1) stop words, 2) undesirable words, and 3) 1-3 character words. You will use this in some, but not all analyses. Notice that stop_words has a word column, and a new column called word was created by the unnest_tokens() function, so anti_join() automatically joins on the column word. prince_words_filtered is a data frame with 36916 total words (not unique words) and 10 columns. Here is a snapshot: (I just picked one word and limited its appearance in 10 songs and used select() to print the interesting fields in order, using knitr for formatting again). This shows you the tokenized, unsummarized, tidy data structure. You can see that each row contains an individual word which would be repeated for each song in which it appears. In music, individual word frequencies carry a great deal of importance, whether it be repetition or rarity. Both affect memorability of the entire song itself. 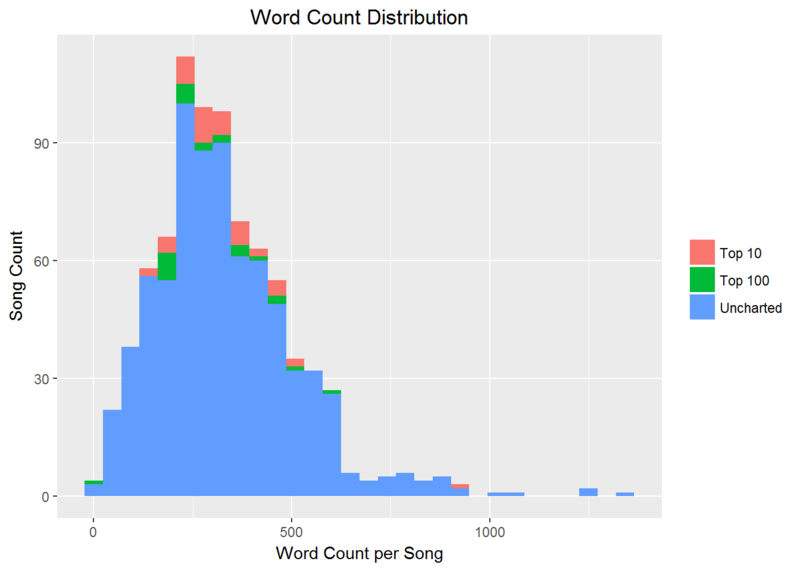 One question a songwriter may want to know is if there is a correlation between word frequency and hit songs. So now you want to take the tidy format one step further and get a summarized count of words per song. 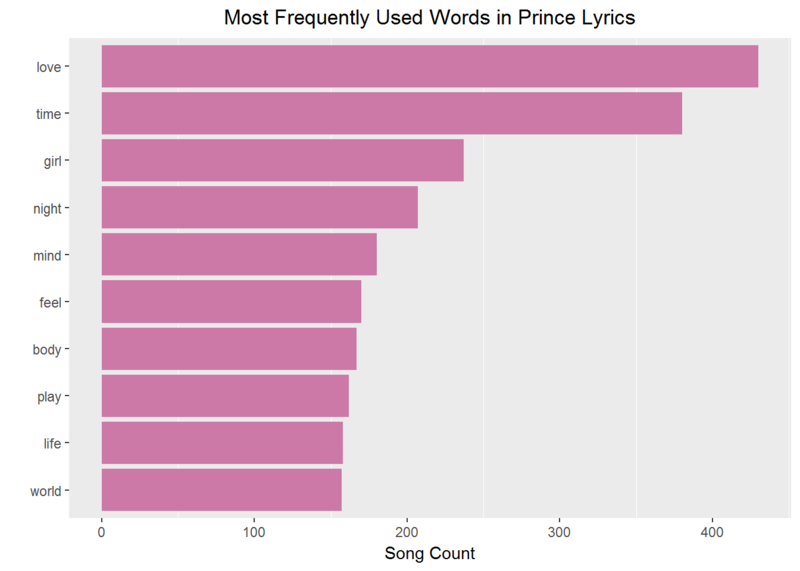 To examine this format in Prince's lyrics, create a histogram showing the distribution of word counts, grouped by song, per placement on the Billboard Charts. Unnest the prince lyrics again without filtering any words to get a true count of word frequency across songs. Again use group_by() and summarise() to get counts. Then use the dplyr verb arrange() to sort by count. First, take a look at the highest counts, then use ggplot() for the histogram. Notice it's right skewed. Given the nature of the lyric transcription, I'm skeptical about data entry errors. So, out of curiosity, take a look at that Top 10 song with over 800 words. I did a little research and discovered that this particular song has a guest artist who performs a rap section. That certainly explains it! Remember, this dataset covers Pop and R&B charts globally, so genre and geography can greatly affect your assumptions. Notice the US Pop chart ranking was much lower than other charts, peaking at 5 in Canada, for example. Just something to keep in mind. Challenge: If you're inspired to tackle music analysis on your own, you might want to check out The Million Song Dataset which has over 50 features (e.g. tempo, loudness, danceability, etc.) for almost 50,000 artists! Adding musical features to lyrics makes for a very comprehensive analysis. In order to do a simple evaluation of the most frequently used words in the full set of lyrics, you can use count() and top_n() to get the n top words from your clean, filtered dataset. Then use reorder() to sort words according to the count and use dplyr's mutate() verb to reassign the ordered value to word. This allows ggplot() to display it nicely. As in most popular music, love seems to be a common topic. I wouldn't make many assumptions given just these top words, but you can definitely get some insight into the artist's perspective, just not the whole picture. Before moving on to a deeper investigation, take a minute to have a little visual fun. Word clouds get a bad rap in many circles, and if you're not careful with them, they can be used out of context where they are not appropriate. However, by nature, we are all very visual beings, and there are cases where real insight can be gained. See some examples by Sandy McKee here. Just use them with a grain of salt. So far you've just viewed the top words across all songs. What happens if you break them up by chart level? Are some words more prevalent in songs that reached the charts verses uncharted songs? These are considered popular words by society. Notice in the code below the use of slice(seq_len(n)) to grab the first n words in each chart_level. This works differently than top_n() and turns out to be a good choice when using faceting in your plot. (Always remember there are different ways to do tricks like this.) You can also use the row_number() function to make sure you can list the words in the right order on the graph. ggplot() by default would sort words alphabetically and it's good practice to do your sorting prior to graphing. What are the insights that you now gather from the above? Well, the top words across the chart levels are very, very similar. This doesn't look good for our hopes of predicting whether a song will succeed based on lyrics! But you've only touched the surface of what is possible with text mining, and eventually NLP and predictive modeling. Some words in music are considered to be timeless. Timeless words persevere over time, appealing to a large audience. If you break down your analysis across decades, these words roll to the top. Use filtering, grouping, and aggregation to get the top words for each decade from Prince's lyrics and see what words can be considered timeless or trendy. You can use ggplot() with facet_wrap() to view by decade. Clearly love, time, and girl are timeless. But how easy is it to spot trendy words? Was truth trending at the turn of the century? Could it simply be that something like it is just a highly repetitive word in certain songs? Does frequency actually identify themes? Does this work for lyrics in the same way it would other text mining tasks such as analyzing State of the Union speeches? Word length is an interesting topic for songwriters. The longer the word, the harder it is to rhyme and squeeze into a pattern. 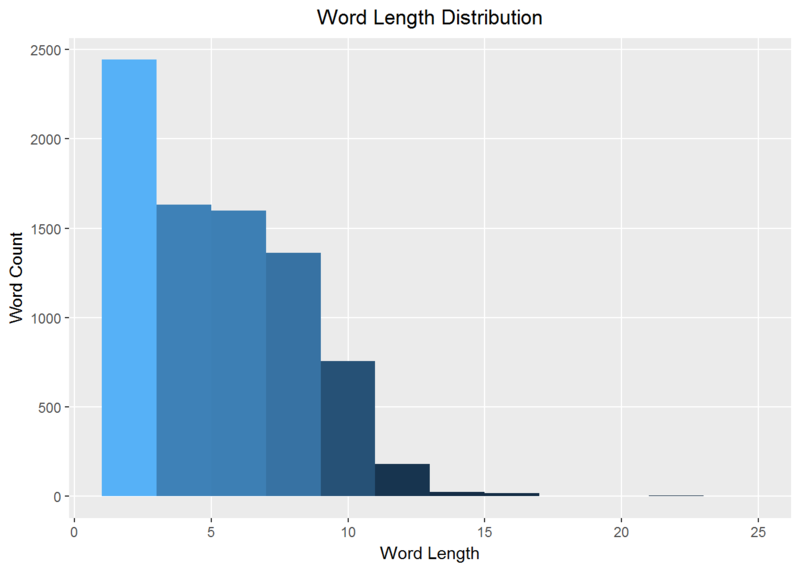 This histogram of word lengths shown below is as you would expect, with a few incredibly long exceptions. 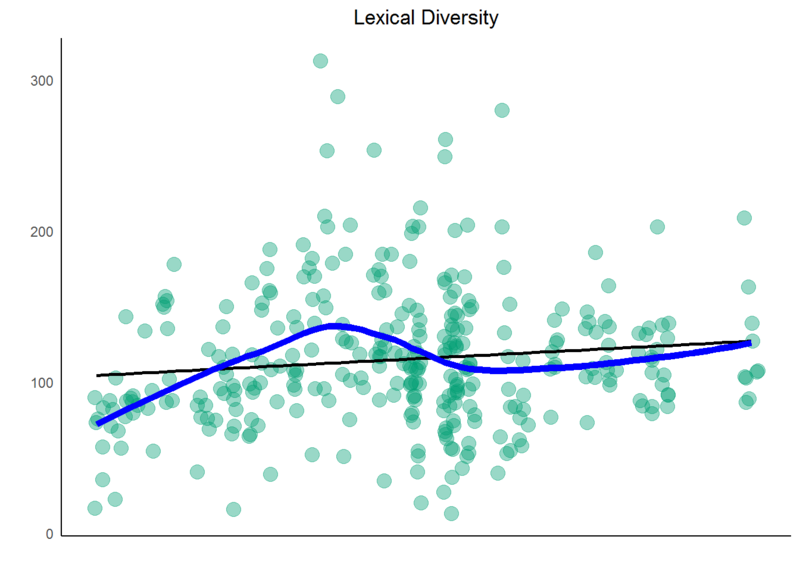 The more varied a vocabulary a text possesses, the higher its lexical diversity. Song Vocabulary is a representation of how many unique words are used in a song. 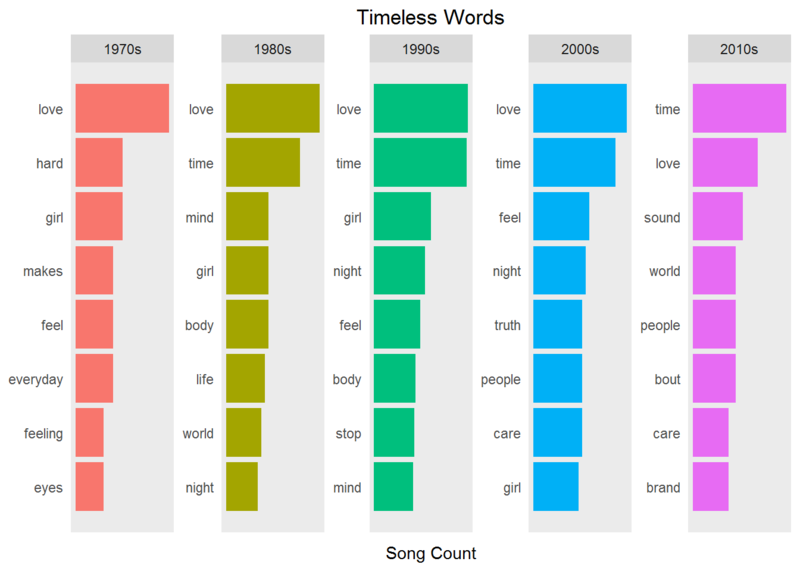 This can be shown with a simple graph of the average unique words per song over the years. You'll want to tokenize the original dataset again but leave in all stop and short words since you're looking more at quantitative insights in this plot. What does this mean? Over the past few decades, there was a slight upward trend in Prince's lyric diversity. How does this correlate to chart success? Hard to say, really, but go ahead and plot density and chart history for further comparison. 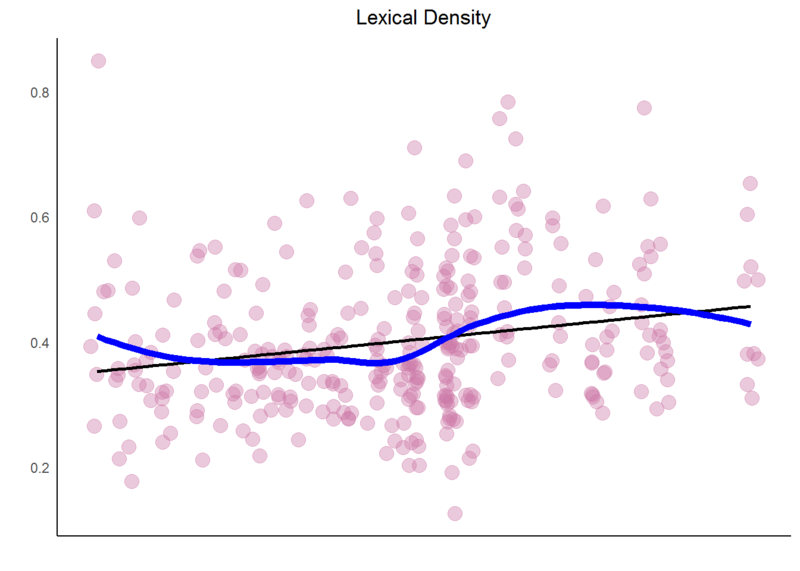 Take a look at Prince's lexical density over the years. For density, it's best to keep in all words, including stop words. So start with the original dataset and unnest the words. Group by song and year and use n_distinct() and n() to calculate the density. Pipe that into ggplot() with geom_smooth(). Add an additional stat_smooth() with method="lm" for a linear smooth model. In order to compare the trends, create a plot for his chart history (i.e. successful songs that reached the charts) and compare it to diversity and density. Use grid.arrange() from gridExtra to plot them side by side. From the above, you see that there is a slight increase in Prince's lexical diversity and density over the years. How does this trend compare to all popular music? One study shows that Hit Songs have seen a declining lexical density, indicating increased repetition (i.e. "more words with less to say"). That is not what happened with Prince's songs. Another study reveals that across all popular music, diversity (unique words) has increased over time, which positively correlates with Prince's music. This is perhaps tied to greater genre diversity in chart rankings over history. Genre is a critical piece of data that does not exist in this dataset. Could it be that his chart history declines for popular music but increases for R&B/Rap? Challenge: I'll leave you to consider these results and even encourage you to look for different datasets where you can leverage these skills on your own! Just remember, correlation doesn't imply causation. The method that you've been using so far looks at the entire dataset, but it has not addressed how to quantify just how important various terms are in a document with respect to an entire collection. You have looked at term frequency, and removed stop words, but this may not be the most sophisticated approach. The IDF of any term is therefore a higher number for words that occur in fewer of the documents in the collection. 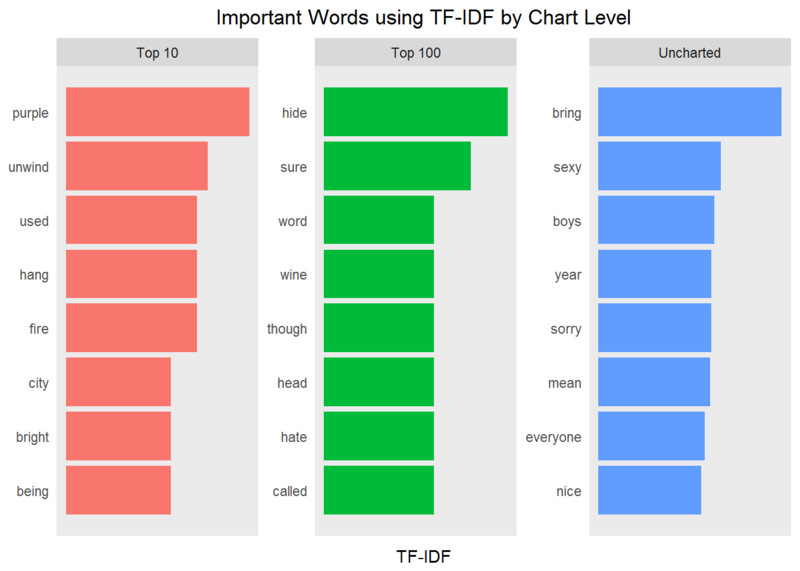 You can use this new approach to examine the most important words per chart level with the bind_tf_idf() function provided by tidytext. This function calculates and binds the TF and IDF, along with the TF*IDF product. It takes a tidy text dataset as input with one row per token (word), per document (song). You'll see the results in new columns. So, take your original Prince data frame and unnest tokens to words, remove undesirable words, but leave in the stop words. Then use bind_tf_idf() to run the formulas and create new columns. 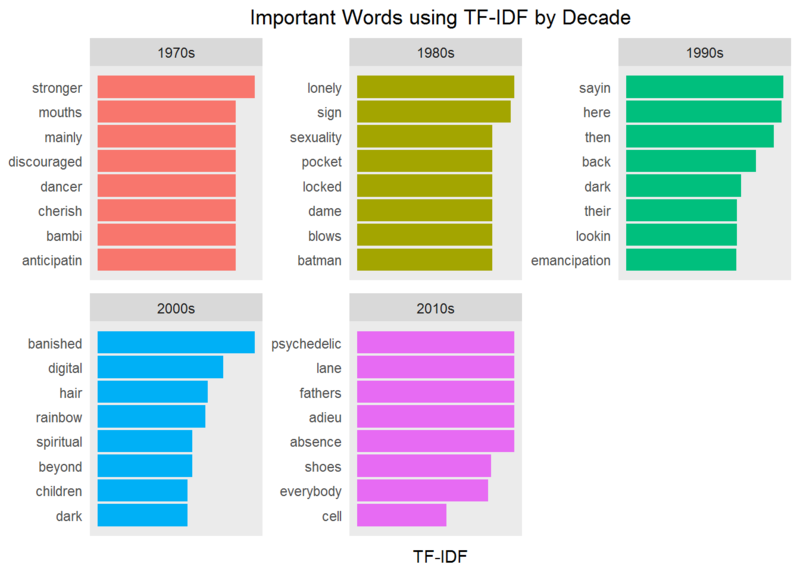 Now you can see that IDF and TF-IDF are 0 for extremely common words. (Technically, the IDF term will be the natural log of 1 and thus would be zero for these words.) Pipe your results from above into arrange() and descend by tf-idf. Add a few more steps and you'll see a different way of looking at the words in Prince's lyrics. Wow, using TF-IDF certainly gives us a different perspective on potentially important words. Of course, the interpretation is purely subjective. Notice any patterns? You are definitely getting a deeper level of insight now. The timeless words are no longer prevalent. Are you starting to see topics or themes emerge? Is that really possible with just a few words per group? You'll take this to new heights in the second tutorial (Part Two: Sentiment Analysis and Topic Modeling with NLP). In this case study, you first took a glance into the actual data, looking only at the basics. After performing some conditioning such as data cleansing and removing uninformative words, you began an exploratory analysis at the song level. Next, you delved deeper into text mining by unnesting lyrics into tokenized words so that you could look at lyrical complexity. The results provide critical insights for the next steps of sentiment analysis and topic modeling. Finally, you used TF-IDF analysis to represent the information behind a word in a document relating to some outcome of interest. You may think that this is a good way to identify themes in music, but you really only have half the story. Part Two addresses an unsupervised learning method called Latent Dirichlet Allocation (LDA). As in all aspects of Data Science, there are many methods to choose from for gaining insight. And in Parts Two and Three of this case study, you'll address more of these options. Hopefully you are as excited as I am to continue this journey from exploratory analysis on to sentiment analysis, topic modeling, and predictive insights. Thanks for reading, and I hope to see you in the next tutorial!